Please PRINT this form (use Print Form button at bottom) and TAKE IT WITH YOU with you when you visit the prospective adopters or foster family. Then COMPLETE THIS FORM ONLINE within two days of performing the House Visit. Please provide as much information as you can. Please list the names (if children, ages; or relationship to adopter - roommate/parent) of everyone who was present during the house visit. Does it appear that all members of the family/household (don't forget roommate, parent, semi-live-in friend) are in agreement about adopting/fostering a basset hound? Did all members of the home seem interested in the adoption/fostering? If no, explain. Are these people young, middle-aged or seniors? Do they have the physical ability to exercise the dog(s) particularly if there is no fenced yard? If you brought your own dog to the house visit, please comment on how the applicants interacted with the dog - especially the children and other animals in the house. Are they experienced dog owners (owned dogs before) or are they novice dog owners? In your opinion, do they seem like responsible dog owners? Where do they plan to keep the dog while they are away from home (while at work or out for family activities)? If gone for long hours during the weekday and they do not have a doggie door, what arrangements have they considered for letting the dog out during the day for breaks (e.g., dog walker, come home for lunch, neighbor, etc.)? If the applicants have children and if they live on a busy street, how will they prevent the children from opening the door and accidentally letting the dog out (if not into a fenced yard)? Do they plan to leave the dog tied out on a lead (staked)? Are they aware that it is against BROOD policy to leave a dog outside on a lead/stake while unattended? Do the applicants plan to allow the dog to be unattended while staked outside on a lead (in a non-fenced area)? Would the applicant be able to tolerate housetraining accidents in the house while the adopted/foster basset adjusts? This is common even with housetrained dogs. 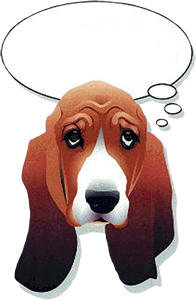 If the home is rented, advise the applicants that a copy of their lease agreement, a lease addendum, or signed letter from landlord permitting them to have a basset hound is required in order to adopt/foster. Does it look as though a basset would be welcome in the home? Does it seem as if the applicant might be obsessively neat or contrary-wise someone who is dangerously sloppy? If the applicants seem to be neatniks, how do they feel about slobbering, shedding, furniture-hogging hounds? What is the household's activity level based on your observations while visiting? Type of gate and latch - is it easy to escape? Do they have a dog door? How many hours per day will the dog be in the kennel run? Is the floor concrete or grass, and how often will it be cleaned? Does the home have stairs that an animal would need to use to get around the house or go outside to use the bathroom? If there are other animals in the home, what are they (dogs, cats, birds, reptiles, rabbits, etc.)? Please comment (as appropriate) on their apparent condition and happiness as you observed them (i.e., are they clean, groomed, nails at an appropriate length, etc.). How do the applicants appear to interact with these pets? If there are other animals listed as living in the home on the application, but which are not visible - were you able to meet them? Does the number of animals that are actually in the home match up with what was put on the application? If there are dogs in an outside kennel, are they listed on the application? What did you observe about the cats' ability to co-habitate with a dog? Would the cat(s) be more compatible with a young, energentic dog, or a laid-back dog? Has the cat(s) ever lived with a dog or been around other dogs? Is the cat dog friendly? Being a Foster Home is the most critical job in BROOD. It is rewarding but not always easy. Why are you interested in becoming a Foster Home? Basset hounds are pretty easy to groom. Ask applicant if they know the basics of ear cleaning, nail trimming, bathing, and if they are comfortable with performing these functions. Basset hounds are prone to two very serious conditions: bloat and glaucoma. Ask the applicant if they have read and undstand the warning signs for both conditions. Many foods are not good for dogs. Ask the applicant if they understand that some foods and human medications are deadly for dogs (e.g., chocolate, onions, raisins/grapes, cold medications, Tylenol, etc.). Do they understand that they need to contact their vet, poison control and the Foster Director in the event their foster dog ingests anything bad? Ask the applicant if they understand that BROOD requires good photos and short videos of foster dogs for the websitie, and that these need to be uploaded to the BROOD Dropbox site. Ask the applicant if they understand that BROOD requires a Foster Dog Report ten days after the foster arrives and every few weeks or if the dog's behavior changes (e.g., it is now fully housetrained). Ask the applicant if they understand that BROOD communicates with the fosters by email. Make sure they understand they will need to check email daily to answer questions about their foster. Emphasize the importance of maintaining timely communications. Ask the applicant if they understand that BROOD foster dogs are required to attend the Ramble in September (usually the 3rd week). Is the applicant willing to work with a trainer to address behavioral issues? Discuss with the adopter/foster the fact that some issues may take some time to resolve. In your opinion, what are the applicants' strongest and weakest qualifications to adopt from BROOD? Please include both favorable impressions and anything that may have set off a "warning bell."